Anti-virus - Real time protection against viruses, worms, trojans and rootkits. Anti-spyware - Real time protection against spyware, key loggers and other malware programs. Hands-free security updates - No user interaction required. Great for connected families, SecureIT Plus does it all. You get all the standard features plus parental controls, content filtering and disk defragmentation to keep your computer not only protected but optimized. One SecureIT Plus license per computer. 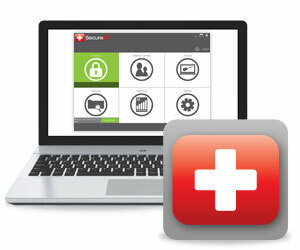 Real time protection against spyware, key loggers, and other malware programs. Prevent hackers from entering your computer. See important real-time details for every security threat stopped. Ensure your PC runs at optimal performance with disk defragmentation software. Requires Supported Remote Installation on a clean PC. Scan your PC for known bloatware programs and start the removal process of those programs. Scans your PC for common ransomware and behaviors, then quarantines.